During the month of July, twelve New Haven area public school students, three college interns, and one Master Artist came together at Artspace to create an ambitious and exciting new art project. Tag and Repeat x2 consists of two individual yet connected works of art. 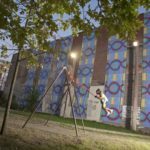 The first is a site-specific installation in The Lot—a nearby municipal pocket park and transit stop located at 812 Chapel Street. At The Lot, six enormous 40’ x 7’ painted vinyl banners span the 100’-long façade of one of the buildings that encloses the space. Suspended from the roof, the vibrant colors and patterns of the banners pour over the edge like a streaming waterfall, instantly activating this otherwise conventionally dormant space. 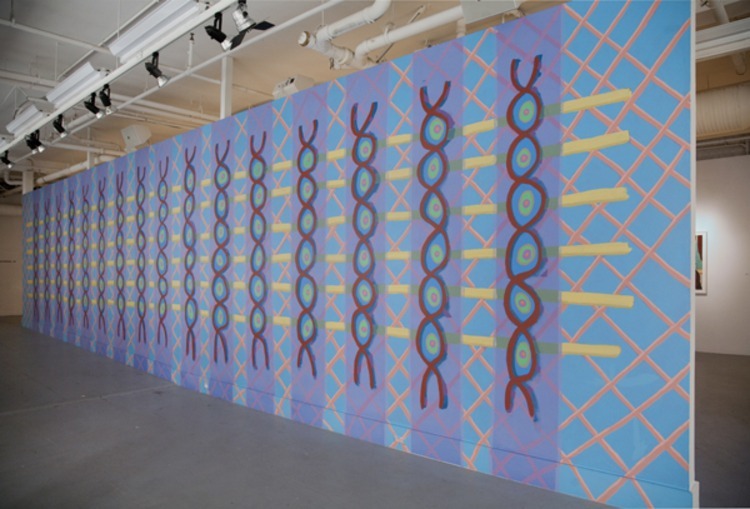 The second, complementary work is a 40’ x 8’ wall painting located on one of the long walls in the Artspace galleries. 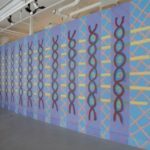 The large-scale paintings on view in both locations were designed and produced by SAP Master Artist, Cat Balco, her team of interns, and the Summer Apprentices. Conceiving two new, site-specific works of art that cover more than 2,000 sq. ft. is no small feat. As an abstract painter, Cat Balco works primarily with color, pattern, and non-representational forms on canvas. For this project, her second large-scale painting installation and first public artwork, Balco uses the vernacular of painting—form and color—to stage interventions in existing architectural spaces that transform the way we think about public and private space. In preparation for the installations, the artist asked the students to help her create a graphic icon as the subject of the paintings. 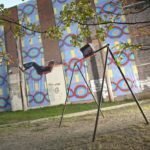 Thinking about energetic young people, summer, and the placement of painting in a public park, Balco asked her students: What does the idea of play look like? How can we represent the activity of play without directly showing it? In response to her questions, the apprentices drew images that symbolized play. The helix-type form that appears repeatedly throughout the banners and wall painting, serves as the logo, or tag, for SAP. It embodies the activity and dynamism of play, yet also speaks to more profound ideas. The minimal spiral structure of the icon echoes that of human DNA, which forms the basis of nearly all living organisms and is the carrier of genetic information. Even though we all have DNA, it is the elemental material that separates and distinguishes each of us from one another. The large-scale paintings similarly embody this notion of individual and collective identity. While we read the works as unified compositions, each of the students contributed their own handiwork to the creative process. In the paintings, the students’ individual marks accumulated over time; each day, their collected marks transformed formerly blank walls and empty spaces into vibrant portals and visions. 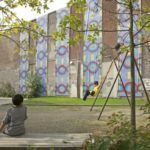 In Tag & Repeat x2, SAP connects interior and exteriors spaces and individuals with community and enlivens the promise of transformation that art continues to hold.